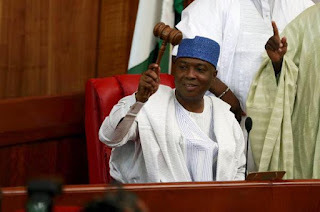 The newly elected president of the Senate, Bukola Saraki, has pledged to be just and fair to Nigerians, and to defend the independence of the National Assembly. He made this known in his acceptance speech at the inauguration of senators at the National Assembly on Tuesday. He thanked his colleagues for electing him as their leader. “I am most honoured and privileged to be elected to serve as President of the Senate. I accept with humility and respect the honour you have conferred upon me today,” Mr. Saraki said. “We have today demonstrated that even though we may belong to different parties, we are ultimately united by our common desire to entrench democracy and allow its principle guide our conducts. “The change that our people voted for is a change from a life of poverty, misery to a life of prosperity, happiness, security and comfort, accountability and respect for democracy. He added that as the President of the 8th Senate, he will be guided by the enormity of the responsibilities that the moment imposes on all of us. Mr. Saraki said it will be his responsibility to protect the independence of the legislature in the overall interest of democracy. He said the quest for autonomy must not lead people into pursuing adverse relations with other arms of government. He saluted President Muhammadu Buhari for remaining steadfast in his defence of the right of the National Assembly to choose its own leaders. He thanked all other party leaders who strived to resolve all conflicts, urging that the senators should now move forward with renewed confidence and support. “My dear distinguished colleagues, we are entering at a time when a lot is being expected of us. “Nigerians expect that the new senate must make laws that will reform the oil sector, the security systems, diversify our economy, create jobs and make doing business in Nigeria more competitive. “In the coming days, we shall be converging to hammer out an agenda that will help us focus and deliver on the minimum expectations,” he said. “I have inherited from my predecessor a great landmark. Shortly after the speech, the senate adjourned to Wednesday.